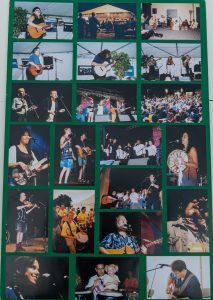 The 2001 CKCU Ottawa Folk Festival, held August 24 to 26 at Britannia Park, had a stellar lineup of performers. American folk hero John Prine thrilled the capacity audience with a two-hour concert. Canadian folk icons Kate and Anna McGarrigle were awarded the Helen Verger Award, while up-and-comer Evalyn Parry was presented with the first annual Beth Ferguson Award. CBC broadcaster and storyteller Stuart McLean was on hand throughout the weekend, including a session where he read letters from overseas CUSO volunteers. With the theme of One Canada, Many Cultures, the eighth annual festival presented five special theme sessions and showcased First Nations, Québécois, African, Asian, Latin American and Caribbean musicians. The featured musicians included Celso Machado, Juan José Carranza, The Mighty Popo, Galitcha, George Sapounidis, Jeremy Moyer, Qiu Xia He, Women Ah Run Tings, Ball and Chain, El Hadi and Pierre Schryer. Chopper McKinnon and Karen Flanagan McCarthy returned to host the main stage throughout the festival. 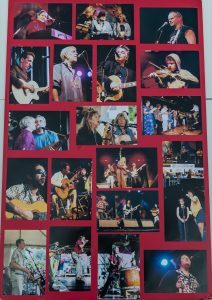 During the 2001 festival, we also paid tribute to Ottawa Folklore Centre co-founder Terry Penner and blues musician Larry “The Bird” Mootham, who both passed away since the last festival. The festival’s choir was renamed The Terry Penner Weekend Choir, and a one-hour tribute session to Larry called The Bird Still Flies, was held on Sunday. Friday evening opened with the thundering rhythms of Japanese traditional drumming group, Oto-Wa Taiko, followed by Ottawa Folklore Centre owner Arthur McGregor performing an acoustic guitar version of our national anthem. Raggamuffin, a lively reggae fusion band, next took the stage. The audience was then treated to a reunion of the folk band Pied Pumkin, whose members include Rick Scott, Shari Ulrich and Joe Mock.The group’s last Ottawa festival performance was at the Festival for the Folks in 1976. Following the intermission, festival goers warmly applauded a captivating performance by Jesse Winchester, a popular American-born musician and songwriter who has lived in Canada since the sixties. The Wyrd Sistersperformed with their usual aplomb, their set running the gamut of styles from jazz to folk. Controversial Cape Breton fiddler Ashley MacIsaac caused a sensation when he launched into a whirlwind-paced set accompanied by John Allan Cameron on guitar. Hard pressed to keep up with MacIsaac’s frenetic fiddling, Camerondisplayed characteristic Maritime humour when he opened a song with the comment “Now I’m going to do a song Ashley has never heard.” The evening ended with a set of hard-driving story songs by Fred Eaglesmith, to the delight of the many Fredheads in the crowd. His six-piece band included both Willie P. Bennett andWashboard Hank. This year, the festival added a new daytime stage located in the food court area. In all, there were eight daytime stages, which started at 11:00 a.m. and ran all afternoon. Festival goers had to make sometimes difficult choices of which session to attend in a given time period. Fortunately, because of the informal nature of the festival, it was possible to move between the stages during daytime sessions. Artistic Director Chris White was happy to see so many people arrive at the festival early in the day to enjoy the myriad opportunities for participation, as well as the performances. “There is a definite element of magic in thespirit of community that exists in that beautiful park by the river, and in the activities that take place there duringthe day,” White commented. The CS CO-OP Family Area offered a variety of entertainment, workshops and activities, including face painting, instrument making, hat and jewellery making, bubble blowing, tie-dyeing and papier-mâché making. On the Nortel Networks Stage, Saturday morning opened with a special live broadcast of the longest-running folk show on community radio in Canada: CKCU-FM’s Canadian Spaces. The session was hosted by Chopper McKinnon, with guests Joe Bishop & Kendall Sullivan, Roy Forbes, Selina Martin and Terry Tufts. Ron Moores hosted the second half of the broadcast, billed as CKCU-FM Back 40, with guests David Francey,Jenny and Dan Whiteley, Michele & John Law and Willie P. Bennett. The next session, CBC Radio’sBandwidth Live, was hosted by Bill Stunt and showcased the talents of Don Ross, Ember Swift and The Cash Brothers. Shari Ulrich hosted the session Shari and Her Boyfriends, with Rick Scott, Joe Mock, Roy Forbes and Jesse Winchester. The Ontario. More to Discover Stage located inside Lakeside Gardens, offered a diverse range of performers. The session alt.folk@saturday.com featured host Ember Swift with First Chance Saloon winners, alicide andDarlene. Dean Verger hosted Rasputin’s Folk Café with guests Kevin Cardamore, Nicholas Williams andShari Ulrich. The Rick Scott for Kids family concert was well attended. My Favourite Things was hosted byDan Whiteley and Joey Wright, with guests Joe Bishop and Selina Martin. The participatory session Dansezwas led by Joséphine. Derek Debeer, a former member of the South African band Jonny Clegg and Savuka, led a drumming circle with enthusiastic audience participation. The Phase 2 Stage on the hill opened with the lively session Six Strings, Many Cultures, hosted by The Mighty Popo and featuring Celso Machado and Juan José Carranza. Stephen Fearing hosted the sessionSharing Our Stories with Kris Northey, Marcel Bénéteau and Willie Dunn. The Jay Willis Band and theJenny Whiteley Band performed in a double bill. The Have Song, Will Travel session featured host Jim Bryson, Fred Eaglesmith, Kendall Sullivan and Stephen Fearing. The fast-paced Fiddle Fever session showcased the music of host Oliver Schroer, Anne Lindsay, Ashley MacIsaac, Pierre Lessard, Pierre Schryer and Valerie Vigoda. Mary Gick appeared in the last session of the day. The Rogers Stage, located around the corner from the Phase 2 Stage, opened with a double bill featuring the Ottawa bands Siobhan and Satellite. A tribute to the popular Quebec club, The Black Sheep Inn, was hosted by Paul Symes and featured Darlene, Fred Eaglesmith, Susan Werner and Jim Bryson. The East Coast Kitchen Party was a spirited musical celebration. It featured host Greg T. Brown, Ashley MacIsaac, Siobhan,and surprise guest Pierre Schryer, who was rushed in from the airport just in time to join in the fun. Spirit Wind hosted the Harmony session with The Cash Brothers and The Wyrd Sisters. Jesse Winchester earned a standing ovation at the finale of the Beyond Borders session with Michele & John Law and host David Francey. The daytime entertainment ended with the eclectic Anne Lindsay Band. The Capital Double Decker & Trolley Tours Stage wins the award for longest stage name! The stage, located in the west field, opened with a double bill featuring Jason Fowler and Kris Northey. Spirit Wind hosted the session When the Spirit Moves You featuring El Hadi and Kiva. The entertainment also included two more double bills: Anne Lindsay Band and Michele & John Law, as well as Terry Tufts and Willie Dunn. Guitarist extraordinaire Don Ross hosted the session A Sense of Place with Oliver Schroer and Marcel Bénéteau. Michael Jerome Browne’s half-hour concert was the final performance of the day. The OFC Music Stage, sponsored by the Ottawa Folklore Centre, offered a splendid afternoon of participatory sessions. The first session, Sacred Harp Singing with Shelley Posen, introduced the audience to this American style of singing. Wendy Moore hosted an Introduction to Stepdancing, Willie P. Bennett led the Harmonica Workshop, and Arthur McGregor presented the Rise Up Singing singalong. There was also a rehearsal of the Terry Penner Weekend Choir and a Musical Mentor Showcase featuring Terry Tufts and teachers and students of the Ottawa Folklore Centre Canadian Musical Mentor program. 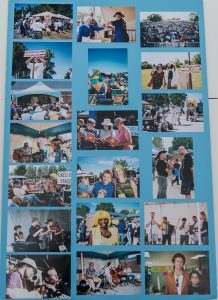 The CKCU-FM 93.1 Stage located in the food court, held captivating concerts with Ian Bell; Chinese pipa player Qiu Xia He; Joséphine; First and Last Chance Saloon winners: alicide, Kevin Cardamore, and The Jay Willis Band; and Spirit Wind. The Hot, Hot, Hot session featured a spicy menu of performers, includingJuan José Carranza (host), Celso Machado and Women Ah Run Tings. The CS CO-OP Family Stage in the family area opened the day with a Drumming and Music session withSpirit Wind. Nicky Brodie of Salamander Theatre hosted A World of Stories, followed by Just Kiddingwith George Sapounidis. Michael Jerome Browne appeared in the wonderfully named Tap, Clap, Snapsession. Fit As a Fiddle featured Pierre Lessard. Ian Bell hosted The Good Old Days session. The afternoonentertainment ended with Dean Verger’s Storytime with Uncle Dean. The CS CO-OP Family Crafts area featured demonstrations on how to make sun-catchers (Thomas and Naomi Burke of Glass Works), jewellery (Heather Boyd of Filament), wood plaques (Ron Tremback of Solar Woodcuts), and sock puppets (Phil Boyko of Valen Enterprises). The featured concerts on the Nortel Networks Stage began on Saturday afternoon with concerts featuring the jazzy alternative music of Ember Swift and the country-tinged rock from The Cash Brothers. The vibrant group Women Ah Run Tings exploded onstage in bursts of colour and sound, with their heady mixture of reggae, hip-hop, R&B and funk/rock. Gypsy-flamenco guitarist Juan José Carranza performed with his six- piece band. Bluegrass was the predominant theme of an evocative set by the Jenny Whiteley Band. The first Beth Ferguson Award, honouring the late singer-songwriter, was presented to Evalyn Parry for her ability to convey human experiences with relevance, intensity and wit through her music. Singer-songwriter Beth Ferguson, who died in 1999, was widely admired for the beauty and clarity of her songs, and for her commitment to communicating honestly about women’s experiences. Passionate singer-songwriter Stephen Fearing was in fine form during his set, wowing the audience with his inimitable guitar playing and intense lyrics. The zany francophone duo Polly-Esther captivated the audience with their folk-rock music. After sunset, John Prine came onstage to a wildly cheering sold-out crowd, many of whom were thrilled to see the American folk music legend for the first time. With his excellent band, Prine maintained the excitement for two hours, playing hit after hit, recent tunes, a four-song encore, and a duet with Jesse Winchester. The eveningdidn’t end there for some of John Prine’s fans. About a dozen of them stayed on long after the concert ended, singing his songs under the stars. On Sunday morning, the entertainment on the Nortel Networks Stage began with Galitcha in Concert. This eminently listenable group performed East Indian folkloric music fused with jazz, classical Indian and Latin styles. The Family Ties session included, appropriately enough, Kate & Anna McGarrigle, Northern Sons, and The Wyrd Sisters. The One Canada, Many Cultures session echoed the theme of this year’s festival andfeatured a variety of styles presented by host Pierre Schryer, El Hadi, George Sapounidis Trio and Ball and Chain. Kathy Grant Mahon & Chosen hosted the gospel-influenced Sing Out session. The Northern Sonssession featured a set with this Ottawa Valley bluegrass band. Ottawa singer-songwriter Jim Bryson presented his well-crafted songs blending rock and folk. The Ottawa band Cheza performed some of their danceable, African-inspired music. The Ontario. More to Discover Stage started the day with a session titled 3 x 2, which featured three sets of duos: Clear (Christian Patterson & Sue Johnson), Joe Bishop & Kendall Sullivan, and Michele & John Law. The Phase 2 Stage started the day with the fascinating session Speaking Out, with host Elana Harte, Evalyn Parry, Kris Northey and Susan Werner. Musical Journeys, hosted by Marcel Bénéteau, included Pangur Ban and Zainab Amadahy of Spirit Wind. The joyful Acoustic Waves Turns 20 session was hosted by Joe Reilly and featured performers who had appeared in this renowned Ottawa folk music series: Celso Machado,Oliver Schroer and The Wyrd Sisters. The Bird Still Flies was a moving musical tribute to the life of the late blues musician Larry “The Bird”Mootham. Hosted by Vince Halfhide, this session featured Larry’s former student Southside Steve, The Mighty Popo and Johnny Russell. East Meets West showcased the talents of host George Sapounidis, Galitcha, Jeremy Moyer and Qiu Xia He. The daytime entertainment on the Phase 2 Stage closed following a half-hour concert with Ball and Chain(Michael Ball and Jody Benjamin). Just around the corner, the Rogers Stage drew a capacity crowd at The Vinyl Café Live with host Stuart McLean, Arnie Naiman & Kathy Reid, Ian Bell and Michael Jerome Brown. The youthful session alt.folk@sunday.com featured host Selina Martin, Jim Bryson and Polly-Esther. The Celtic Rathskallionshosted Electicism(e), which also showcased Joséphine. Ian Bell led the Musical Traditions session withArnie Naiman & Kathy Reid and Kate & Anna McGarrigle. Host Michael Jerome Browne, Darlene,Southside Steve, Suzie Vinnick and Vince Halfhide were featured in the Blues Everywhere I Go session. The day wound down with Nicholas Williams in concert. The Capital Double Decker & Trolley Tours Stage opened with a double bill featuring Marcel Bénéteau andPierre Lessard. Next, famed fiddler Pierre Schryer took the stage. Host Vince Halfhide, Southside Steve,Lady Luscious (Women Ah Run Tings) and Michael Jerome Browne performed in the session Music Moves Me. Three double bills followed, showcasing the following performers: Selina Martin and VSH; Joe Bishop & Kendall Sullivan and Susan Werner; and Evalyn Parry and Polly-Esther. The OFC Music Stage down by the water opened with a Terry Penner Weekend Choir Rehearsal led byAndy Rush. Andy Daub presented the session Tin Whistle for Beginners. The Gospel Sing session was hosted by Anna Williams. Duncan Gillis demonstrated during the Bodhran for Beginners session. The CelticRathskallions Kid’s Show was up next, followed by a second Terry Penner Weekend Choir Rehearsal.Tracy Vilbert’s session, Learn to Belly Dance, wound down the day’s entertainment. The CKCU-FM 93.1 Stage in the food court featured a series of concerts with the following excellent performers: Pangur Ban, VSH, Darlene, Arnie Naiman & Kathy Reid, George Sapounidis Trio, El Hadi,David Francey and Clear. The CS CO-OP Family Stage began the day with the Music Plus session featuring The Celtic Rathskallions.Celso Machado followed with a Children’s Concert. The Rag & Bone Puppet Theatre staged a kid’s showtitled Secrets of Puppeteers. Monica Wolfe presented two Kindermusik sessions. A Sunshine Parade endedthe day’s entertainment. 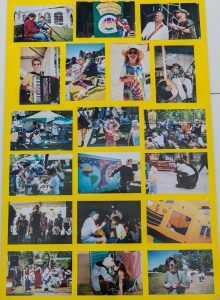 Kids young and old walked across the grounds playing instruments and displayingarticles made in the craft workshops. The CS CO-OP Family Crafts featured demonstrations on how to make the following crafts: sun-catchers (Thomas and Naomi Burke of Glass Works), clay whistles (Brian Harper of Harper Pottery), and candles (Greg Brayford of Doozy Candle). As the song goes, some days the rain must fall. And Saturday evening, the rain came down in torrents, which shut down the main stage for two hours. Undaunted, many of the festival goers crowded into Lakeside Gardens, returning when the entertainment resumed on the Nortel Networks Stage. While indoors, the audience was treated to a magical performance from the Terry Penner Weekend Choir, whose enthusiasm had not been dampened by the rainstorm. The entertainment on the Nortel Networks Stage opened with Joséphine. CBC Radio’s Stuart McLean was up next, followed by singer-songwriter Susan Werner. Celso Machado and Qiu Xia He performed an exotic set combining music played on the guitar and the pipa, a traditional Chinese instrument. Kate & Anna McGarrigle performed and were also presented with the Helen Verger Award for their valuable contributions to Canadian folk music. Since releasing their first album in 1976, the sisters have won two Juno Awards and attained international renown for their delicate harmonies, sensitive lyrics and rootsy North American sound. The festival wrapped up with the set from fiddling sensation Pierre Schryer. The festival held a series of benefit concerts at a variety of venues in Ottawa. The CKCU Ottawa Folk Festival thanks the following sponsors, partners and suppliers: Nortel Networks,Ottawa Citizen, Rogers Television, OFC Music (The Ottawa Folklore Centre), Days Inn Ottawa West, Canadian Heritage, City of Ottawa, National Library of Canada, Ontario. More to Discover, Human Resources Development Canada, Ontario Arts Council, CKCU-FM, CBC Radio One, Xpress, Canada NewsWire, Steve’s Music Store, allgorithms Inc., Nutshell Music, Roger’s AT&T Wireless, Phase 2, The Ottawa Food Bank, Dr. John L. Kershman, Hampton Inn, Integral Acoustics, CS CO-OP, The SOCAN Foundation, Bowie ElectricalServices, Capital Double Decker Trolley Tours, Michael Davies Plymouth Chrysler Ltd., D’Arcy Moving and Storage, Loeb Glebe, Herb & Spice Shop, Alexander Keith’s, Coca-Cola and Key West Loaded Soda.